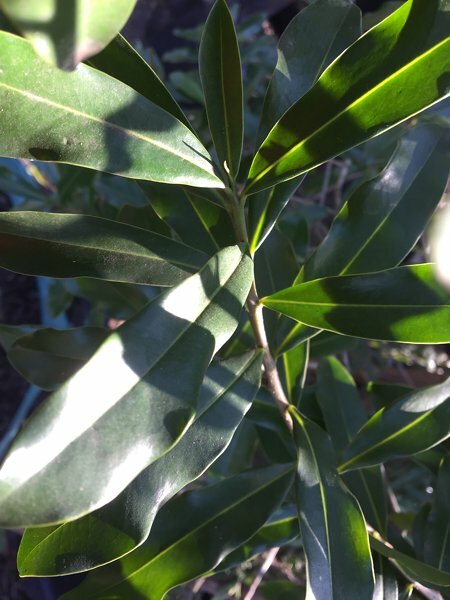 A small to medium sized, slender tree with a thick, erect and very dense canopy of aromatic, markedly asymmetric, deep green, shiny leaves and rich brown, fissured and somewhat mottled bark with a lovely russet tinge on the inside. Petite, greenish-yellow flowers appear between the leaves on lenticel covered stems, and are followed by semi-rounded, dull green fruits. 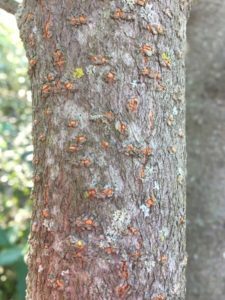 The bark and leaves have a pungent peppery, slightly bitter taste that leaves a burning sensation in the mouth. This is one of our countries most valuable medicinal plants, so much so that it is becoming very rare in the wild and is currently classified as a “Critically Endangered” species in the IUCN Red List of Threatened Species. The specific epithet salutaris means healing, salutary’ or beneficial, and is believed to refer to its many medicinal qualities. Canellaceae – the White Cinnamon family. A family of flowering plants, belonging to the order Canellales. Only one other family, the Winteraceae, belongs to this order. Members of this family are native to the tropical terrestrial ecoregions of the Americas and the Afrotropical zones of Africa (sub-Saharan Africa, extending to the southern and eastern parts of the Arabian Peninsula. Currently, the family is divided into five genera and somewhat 25 species. Several species are important in herbal medicine. 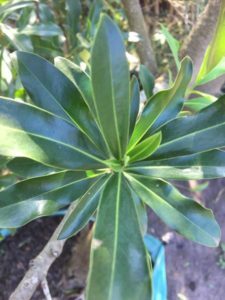 Members are mostly small to medium, aromatic, evergreen and glabrous trees, rarely shrubs. 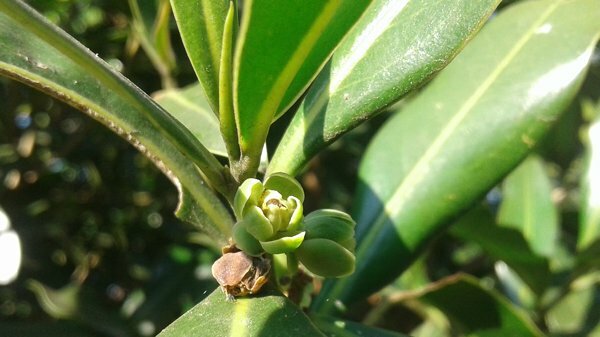 Most representatives have aromatic bark with distinct raised lenticels, and simple leaves with a peppery aroma. The leaves are also frequently pinnately nerved, petiolate, entire margined with pellucid gland dots and lack stipules. They can be alternately, spirally or distichously arranged. The flowers are terminal or axillary, arranged in a panicle or raceme or solitary in the leaf axils. The fruit is a berry with a persistent calyx, containing two or more seeds. This tree has a somewhat scattered distribution across southern Africa, and, due to years of overexploitation, is currently very rare in the wild. Its natural habit is however versatile, and includes evergreen, montane, riverine and dune forests and sand-veld woodlands along the coast, as well as subsidiary bushveld, wooded gorges, drier highland forests and open grasslands. 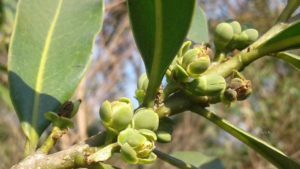 Today, it is only found in a few isolated localities in the north-eastern parts of the country, but previously it could be found almost throughout Zululand, parts of Gauteng, Limpopo and Mpumalanga. The main stem is usually quite short yet slender, with dark, rich and somewhat shiny brown bark that has a faintly roughened, longitudinally fissured texture. As the tree matures, the bark tends to crack more, and eventually develops a lovely mottled appearance. 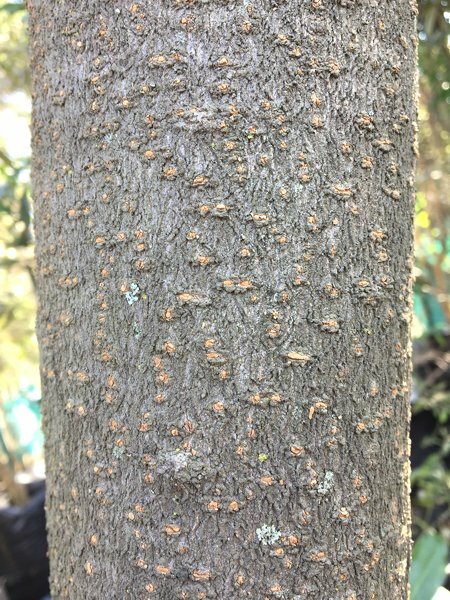 The inner bark has a distinct reddish-brown tinge, with a spicy, somewhat peppery aroma. On young, lax branchlets, the bark is smooth and light grey, turning to a darker and rougher greyish-brown, with prominent, corky, raised yellow lenticels. 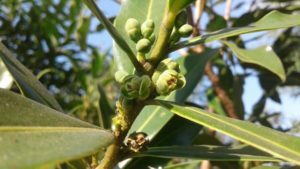 The leaves are simple, alternately or spirally arranged, almost whorled, and are usually carried towards the tips of the branchlets. They are broadly elliptic to oblong-lanceolate (40-110 x 10-30 mm), with smooth margins. 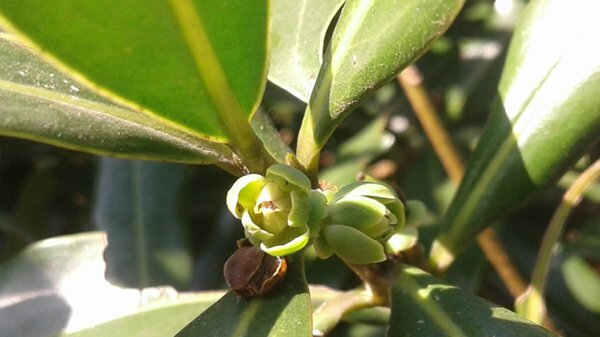 Young leaves are a beautiful blue-green, maturing to a glossy, deep olive green. Below, the leaves are slightly paler, dull green, with obscure venation and a scattering of clear gland dots. The yellowish-green midrib is frequently slightly off-centre. The leaves are without stipules, and the leafstalk is short (2-5 mm) and grooved along the top. Smallish, greenish-yellow or white (5-7 mm diameter), bisexual flowers are carried in the axils of the leaves, and occur either singly or in compact, few flowered clusters or cymes. Each flower has 10 obovate, overlapping and gland-dotted petals, 5 smaller, thinner inner petals and 3 sepals. There are 10 stamens that are fused together into a prominent tube-like structure in the centre of the flower, and this tends to overlap most of the elongate-oblong ovary. 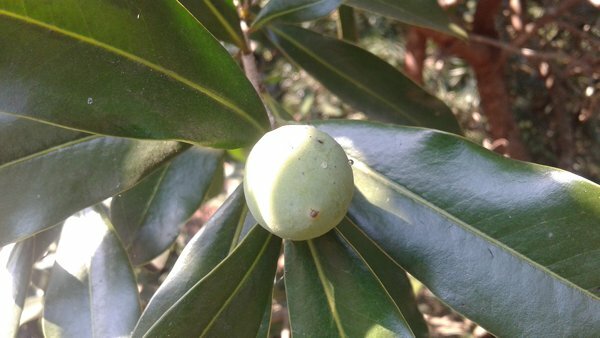 The fruits are semi-spherical to oval, sometimes somewhat pear-shaped, glossy and gland-dotted (40×30 mm). They mature from dark green to purple-black, with a whitish bloom. Each leathery skinned fruit contains 2 or more recalcitrant seeds with an oily endosperm. 5 – 10 m, occasionally reaching 20 m.
Many Warburgia species have high pharmaceutical value due to the presence of numerous complex bioactive compounds in the leaves, bark and roots, and are also a valuable part of ethnomedicine. Pharmacological evaluations carried out on crude extracts and purified compounds provided support for the many traditional uses and have revealed this genus to be a valuable source for many medicinally important compounds. The bark or roots and currently, for the sake of sustainability, and because they are a better source of active ingredients and are more easily replenished, the leaves are used. These parts are dried for use in powdered form, or as infusions and decoctions, as a remedy for many conditions. The bark contains several drimane sesquiterpenoids as well as mannitol, the former believed to assist with antibacterial and anti-ulcer activity. Traditionally, most remedies are prepared from the spicy inner bark, as well as the outer bark and leaves, which contain many compounds known for their antibacterial, anti-fungicidal, antimicrobial, anti-inflammatory, anti-ulcer and diuretic properties. The inner bark is used against many ailments such as malaria, chest pains, colds, coughs, diarrhoea and general bodily pains. The root bark and the bitter, peppery stems are dried, ground and taken as a snuff to clear blocked sinus’. The powder is also mixed with water and this infusion is believed to help get rid of mouth sores. A similar concoction is used as a remedy for malaria, and, if taken internally, is believed to help clear spots in the lungs. These two parts are also used in cold water infusions as expectorants or smoked to treat the common cold and coughs. The bark itself is often powdered, blended with fat and used an ointment to treat burns, skin irritations, sores and as a wound dressing. Concoctions of the bark are also used to treat venereal diseases, abdominal pain, constipation, rheumatism and stomach ulcers. Bark, leaf and root decoctions and infusions are often used to treat abdominal pains, blood disorders, chest complaints, fever, influenza, malaria, gastric ulcers, toothache. backache, inflammations, head ache, skin irritations, respiratory complaints, rheumatism, sores, snake bites, venereal diseases, fungal, bacterial and protozoal infections. Tablets made from the leaves are used as a natural antibiotic that is especially effective against oral thrush. The bark is also a part of many magical and ritual rituals and it is believed to induce trances or to invoke goodwill of the ancestors. The wood of these trees is soft, oily and aromatic, especially when freshly cut. The heartwood is pale greenish-brown and darkens upon exposure to air, turning a darker, yellowish-brown and the sapwood is a pale creamy-yellow. The wood works and polishes fairly well but is not very durable. It is not utilised extensively but has occasionally been used for construction, furniture and various implements. Charcoal and firewood is also made from the timber. Aromatic oils can be extracted from the tree, and the bitter, spicy taste of the different parts are due to the presence of iridoids. The bark also contains tannins, which are used as dyestuffs, and a resin can also be drawn from it. The leaves, fresh or dried, are often used as a chilli substitute and to add a lovely spicy taste and aroma to various dishes. An herbal tea is prepared from an infusion of the leaves. An excellent mulch or green manure is made from the leaves, as the tree has the ability to fix atmospheric nitrogen, which is essential for plant development. Many insect pollinators are attracted to the flowers, while many fructivorous birds eat the fruits and help disperse the seeds. Insect eating birds may also be attracted by the insects that flock to the flowers. The leaves make a good fodder for many herbivorous animals, and hippos are known to eat parts of the tree. A most handsome and stately evergreen tree, with a slender trunk and a densely leafy, erectly held crown that provides lovely deep shade in small gardens or large estates, farms and plantations. 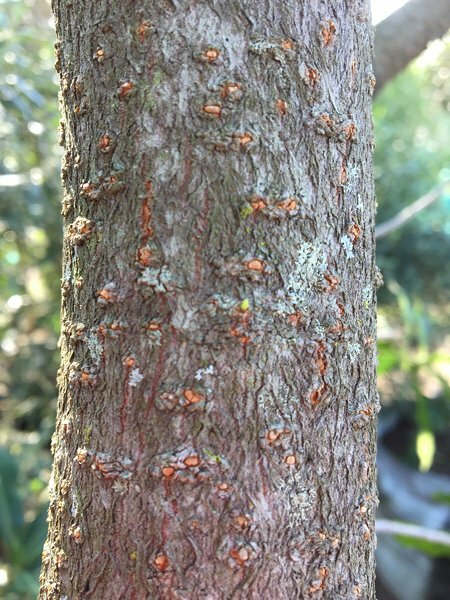 The Pepper-bark makes a fine and versatile single specimen, providing year-round interest and beauty. It responds very well to pruning and coppicing, and, if planted about 1 m apart in rows or groups, will make an excellent and compact hedge, screen or windbreak in warmer areas. Branches can be used as greenery in floral arrangements as they remain fresh and beautiful for a long time, if put into water. 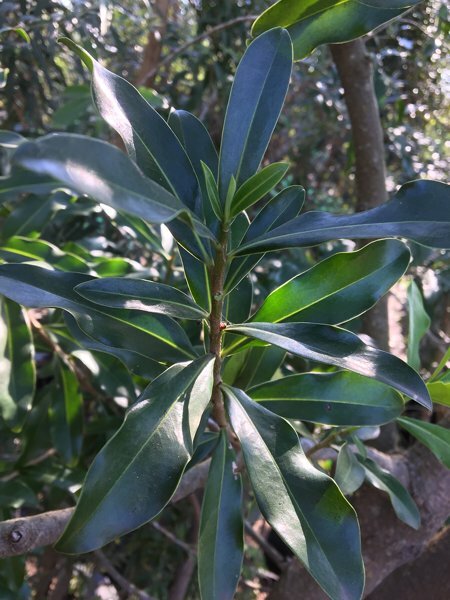 As a container specimen, this tree has high potential – the leaves become richer in colour and glossier, and the tree naturally takes on a neat shape. This tree can be used as a natural soil improver in two ways – it has the ability to fix atmospheric nitrogen due to a symbiotic relationship it has with certain soil bacteria, which house themselves in its roots, and its foliage can be used as a green manure or mulch. By planting this lovely tree, you are also contributing towards its much-needed conservation. These trees are somewhat tropically inclined and grow best in areas where the annual daytime temperature is between 5 and 35 °c. They are not frost tolerant, and young plants can be severely damaged by excessively cold conditions. In colder areas, these trees should be very well sheltered against the cold, especially when young. Established trees are able to tolerate a fair amount of seasonal drought, but they will languish under extended dry conditions. This is a fairly slow growing species. It can however, with proper nourishment, in warm, frost-free areas grow between 600 – 900 mm per year. Requires a warm, sunny location, but will tolerate light, dappled shade. Warburgia grows best in a moist, well-drained, light, sandy, peaty or loamy soil, with good aeration and a neutral to highly acidic ph. If planting in very sandy or nutrient poor soils, give the tree an extra dose of liquid fertiliser or well-rotted compost when planting or in spring. It prefers moist soils but can tolerate dry periods. It prefers an annual rainfall in the range 300 – 1,700mm, but will accept 10 – 40mm – i.e. moderate water needs. Water more in summer and on hot days, slightly less in winter. Warburgia can be grown from seed or cuttings. Seeds should be sown immediately after harvesting, as they have a short viability and are recalcitrant (will not germinate if dried out). Fruits can be soaked overnight in water to help with removal of the fleshy, germination inhibiting outer layer. Sow the seeds into seedling trays filled with a mixture of fine river sand and compost (2:1), then cover with an additional, thin layer of sand. The seeds can be treated with a pre-emergence anti-fungicide. Keep the trays in a temperate, well-lit (not direct sunlight) area and keep the soil moist but not overly wet. The germination rate is usually quite fair and should occur within 2-6 weeks. Once the seedlings have reached the two-leaf stage, they can be planted on into larger containers. 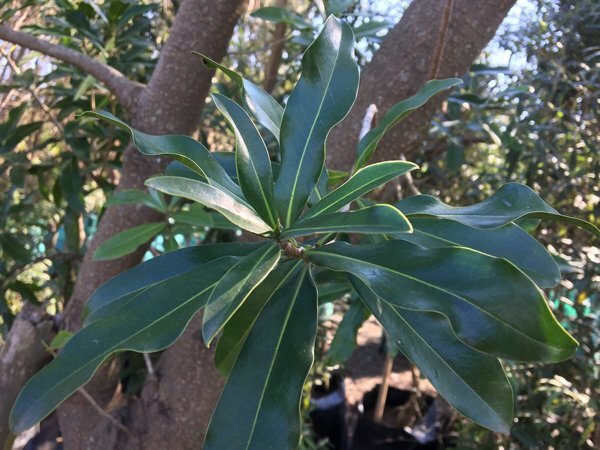 If propagating from cuttings, take semi-hardwood cuttings from actively growing shoots on the tree during late spring to midsummer, place them into a sandy medium such as coarse river-sand or silica-sand, and treat with a rooting hormone (dip the cuttings into the solution). Place the cuttings in an intermittent misting system and keep the area as warm as possible, or simply store them in a shady area. Rooting typically occurs within 4-8 weeks. Rooted cuttings should be potted in a small container with a general mixture of sand (1), loam (2) and compost (1).